Hello everyone, now I want to share my experience when my lecturer, Mr.Rosyid, gave me an assigment to interview a chief coordinator of Indonesian literature. 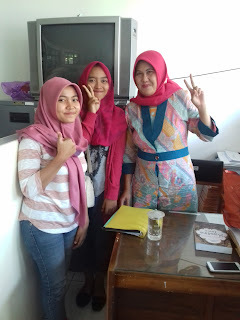 Actually this is a group assignment, so I choose Fitri Sabrina Alwiyah as my partner, and we tried to find the office of Mrs. Sri Nani Hariyanti, M. Hum. A few days ago. Fortunately, when we visited her office, she was able to be interviewed by us. Chief Coordinator of Indonesian Literature. She is from Kebumen. She has two children. She had been in this position since a year ago, exactly in 2015. Besides being a Chief Coordinator, she also teaches many subjects in some faculties, such as the Old Javanese Language and Indonesian literature. She is teaching in Faculty of Humanity, Economics, Agriculture, Law, and Nursing. She also teaching in the other universities, there are Unwiku, Akbid and Literaly Open University. With all this position, of course she has a perquisite. In this interview , she told us about her feeling when she handling both of this positions. At first, she quite difficult to manage her time when she has to attending any meetings, teaching and making a time for her family. Moreover, her little daughter often complain due to her mother rarely has time together. But she always tries to make everything easy. Since the beginning of teaching until now, she feels there is a lot of progress in the learning process. Generally, the process of teaching and learning is good enough, therefore the Indonesian Literature has “B” accreditation. In fact, the alumnus of Indonesian Literature have a good potential to get a job. She hopes Indonesian Literature has higher accreditation in the future and also a good things for Faculty of Humanity.